On September 11, 2001, al-Qaeda terrorists hijacked four commercial airline planes over American soil and slammed them full force with fire and smoke into New York’s World Trade Center Towers, the Pentagon in Washington D.C., and a field near Shanksville, Pennsylvania. 2,996 Americans were killed. 6,000 Americans were injured. Sixteen years later, Americans still remember what happened on that day as they would remember a burning wound that will not heal. Though the response to this historic attack was a swell of American patriotism, there has been a rapid deterioration of the American spirit ever since. 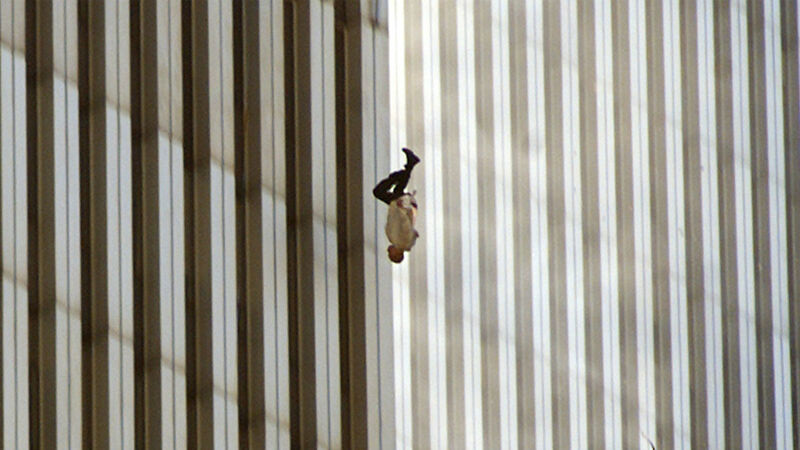 One of the iconic images of horror from the attacks is a photograph (graphic content) of a man plummeting from one of the WTC Towers. The image of this desperate victim of hate was a harbinger of desperate years to come, days even now seeming to plunge to its death, growing more and more chaotic under the growing threat of Islamic terrorism and the loss of American identity. The crisis is augmented in the growing doubt about the meaning of life itself and the loss of a unity of purpose as a nation. It is a tumbling time. It is a time of free fall. Many believe that the next five years will be worse than the past five years. More and more people do not vote. The American workforce is dropping. There is disregard and even contempt for government, churches, and schools. The threat of terrorism grows more and more imminent—even present. The floor has dropped from beneath the feet of the American people. There can be no confidence in a no-gravity situation. The chaos and paranoia of 9/11 has taken on new forms within the fabric of America and driven Americans to new levels of terror and panic. The falling man stands as a warning. The crisis of confidence that Jimmy Carter famously spoke of in the 1970’s is past. The collapse is come. Confidence in the future of the country is clearly plummeting, and without confidence there can be no real progress. As French philosopher Joseph de Maistre said, “Every country has the government it deserves.” It may even be said that the terrorists have achieved their purpose. Sixteen years after 9/11, America is a terrified nation. It will take more than building a wall to pluck up a falling people. It will take more than a ban on Muslims entering the United States to restore a crestfallen country. It will take more than tax reform to lift the spirits of a nose-diving nation. There can be no confidence or courage in comatose lethargy, contentious communities, concentrated materialism, or collective atheism. In days like these, when Teddy Roosevelt’s big stick has been whittled down into a cheerleader baton, the only hope lies in clinging to the bulwark that will never fail. The destiny of America, like any great civilization, is collapse—and its rumblings are in the air as they were palpably on that black September day sixteen years ago—but there is one institution on earth whose destiny is eternity because it is not earthly: the Holy Catholic Church. In Her is the first and last source of support and strength. Faith has the greatest potential to thrive when there is little else to believe in. Hope can never be as strong as in a hopeless situation. Peter was permitted to walk on water to safety. Perhaps America will be permitted to walk on thin air. It is in times of calamity, as in the moment of the falling man on 9/11, that the mystery of life becomes poignant and precious. One of those mysteries, one of the deepest, is the problem of evil. At anniversaries such as these, the attempts to solve the problem of evil seem so futile and frustrating to hearts in pain—hearts seeking answers. When humanity has been lashed so sorely, it is hard to find assuagement in hollow philosophies. That evil is a privation is no comfort to those who have been deprived. Dualism is a poor excuse for death. Even the theological truth that God does not directly cause evil does not stop people from finding fault with God. That He permits evil is often enough to exacerbate the excruciation. The necessary fact of the falling man prevails over rationalizations. In the end, like the act of terror itself, such evils as 9/11 are beyond explanation—but this does not mean that there is no explanation. No matter how shattered and shaken Catholics might feel in the wake of such evil—even after sixteen years—human perplexity cannot overthrow the truth that God is a loving God Whose providence is guided by Divine love. This can never be gainsaid by the staggering horrors of evil, death, and sin. Though they may seem to argue against the providence of God, nothing can disprove the existence of the infinite Good, the infinite God. The sad fact that mankind cannot prevent or abolish all evils does not dismantle this tenet of faith. Though evils like those that brought carnage to the United States on September 11 abound, and ever threaten with a hatred that is inscrutable, equally inscrutable is the Providence of God. It remains as constant as the sun in a sky of clouds. Its life and power is always there, even if it be obscured. It can never be diminished or destroyed. And in that presence is peace. Every act of terrorism seeks to wrest power by violence, but the power of Christian peace must never be surrendered, despite the forces of despondency and despair. As pop-culture media bluntly reminds Americans with painful, ironic poignancy, “madness… is like gravity, all it takes is a little push.” The spirit of America is falling into the madness of moral and mental relativity with terminal velocity. Meanwhile, foes tower and victims tremble in their shadow, bereft of anything like terra firma with a volatile president, an incapable Congress, and an insurgent culture, leaving the nation with no base to withstand the tremors of terrorism and turmoil. For all of the righteous surge of will and power spurred by 9/11, the United States yet seems powerless to reverse the course of things for itself or for the world. Americans must never forget 9/11 or the falling man, and gain from their memory the determination to reverse a surrender to determinism as the battle for Western culture rages on sixteen years after September 11. The prayer of every Catholic American should be that America not collapse as those towers did, but rather bear rather up under the threat of fiery evil with that confidence that has made the West famous in song and story and which has emblazoned the Cross of Christ over the pages of history. 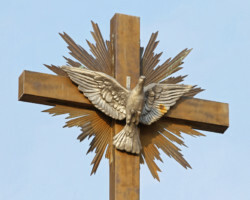 Only faith in Christ can reverse the fate of man from falling to flying. God be with us.